We picked a great year to finally make a trip out to Washington for some cross-country skiing! Steve and I plan to do a rather large ski race in late February, and we hadn’t yet been on our skis. Metro-area Minnesota – at least until today – has been bereft of snow for much of this winter, so we really needed to log some time on the skinny skis. Our friend Jon reserved a great cabin in Winthrop, and we spent the recent holiday weekend up there, mostly skiing, and also enjoying food and board games with him, Amy and Todd. The skiing was great: 20k on first day, 12k on second (hip flexors were screaming from day 1’s effort), and about 10k (quads joined with a howl, as day 2 involved lots of climbing) on the third. The biggest challenge for me was handling my legs on day two. 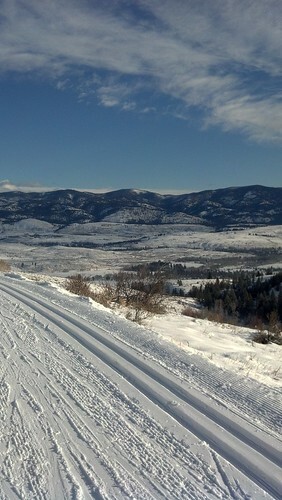 Its funny how 4 hours of classic-style skiing is maybe just a bit too much for my first time out since last February. Ah well. I’ve since recovered and gained more motivation to do some more ski training and lots of healthy eating in the next 4 weeks. The consuming and gaming on this trip was also memorable: while in Winthrop, the four of us did some cooking together, which was good fun and very satisfying: Jon brought along quite a formidable quantity of great mushrooms for a pasta dish, and Amy and Todd cooked up a monster-size batch of great lasagna, the next night. We enjoyed a great post-ski snack -which included some fantastic Polish porter– at Wesala Polana, which was next to the fascinating architectural (and zoning) feat of the Rolling Huts. Our only view of them at the time was from the back, where they look like a bunch of platform tents, sitting above the snow, but “rolling huts” was still something intriguing to see on a ski trail map. On the second day, we enjoyed a post-ski lunch at the beauteous Sun Mountain Lodge, where we watched the Packers lose (on TV) and the stunning evening alpenglow (through the windows) of that day’s sunset. That evening our belated dinner plans were foiled by Winthrop’s early closing hours, so we cooked up an interesting storm, with leftover lasagna, lasagna noodles, onions, and salami. We “suffered” a similar fate the next day, while departing Twisp: the pub there was closed for the MLK holiday, but the Cinnamon Twisp Bakery served us up some good sandwiches, treats and coffee. Gamewise, we enjoyed several hours of Bananagrams, Mexican Train, and Carcassonne. And a short dip in the cabin’s outdoor hot tub. That was bliss, after that first long day of skiing! Recently added (wow, we crammed a lot into this week! ): After a long drive over two snowy mountain passes, we arrived in south Seattle just in time to meet some old friends of mine, Annette, Christina, and Gayle & family, for some great food at Flying Squirrel Pizza. Puget Sound’s great week of snow had just begun, so we all departed at an early hour, to allow for safe travel time. The second part of our trip didn’t involve skiing, but it could have: we got marooned at our Tacoma hotel, due to a freak snow storm that left maybe 8-10 inches on most of the roads surrounding us. This, in a town that gets snow infrequently, and when it does fall, it melts within hours. Usually! It’s a good thing that we’d planned on staying at the hotel and reading those 3 days, though due to weather closures, our dining was limited to just 2 of the 6-8 restaurants on Ruston Way. Thank heaven for the Spar, and also for Duke’s Chowder House! They kept us fed, in between long bouts of reading (I finished 3 books on this trip), identifying the showy waterfowl that were scavenging outside our Ruston Way hotel window (a cute pair of Barrow’s Goldeneye kept us company), and a short run I took along the waterfront. Also, we got in a few short visits with my Dad & Robbi, enjoying some of our meals at the Spar with them, and also heading out to see a movie. We watched the Iron Lady, which I don’t recommend. However, I do recommend the Lakewood Loew’s theater, as all the seats are comfy leather recliners! Our last day was spent in Ballard, an older, funky part of Seattle which I’d never visited. We ate, sipped, and shopped our way around the neighborhood (the Noble Fir was a favorite, as was Second Ascent) until we returned to Jon’s house for some Bananagrams and sleep. The next day, we returned home, our spirits satisfied by the trip of snow fun, friendship and good northwest treats. For more photos, visit this page. Enjoy!